17" 1U Short depth Rackmount TFT LCD Monitor Keyboard Drawer. RKP Series is a combination of keyboard, mouse and monitor into a drawer, with features such as flip-up design, adjustable brackets, built-in LCD OSD to provide effective assistance for an administrator to control multiple PCs. Notebook keyboard with touchpad or trackball supporting multiple languages. Question: Our KVM switch doesn't work properly anymore, When we fire it up, a blue pop up screen appears every time, the pop up screen is kinda like a setting screen, with things like: "scan 10 seconds", "console on/off", also the first computer is lighted up red (on the channel buttons) the 10th computer is lighted up yellow, but their is no cables attached. we don't have any warranty anymore on this product, do you know a solution for this problem or is the KVM switch broken? There could be any number of reasons that your KVM displays these symptoms. Unfortunately, due to the variable nature of individual environments, detailed product support is beyond the scope of this simple FAQ. However, if you can share the make and model of your KVM we may be able to direct you to the proper support network. Question: I am looking into you model Part # RKP-117 . I have a old mount type rack (not square hole type) with 19" width and 24" depth. need a 1080p resolution. Does this one fit my need? Answer: The physical aspects will fit your rack, it will be close, but it should work if you gave a 19" EIA compliant rack and 24" of usable depth. 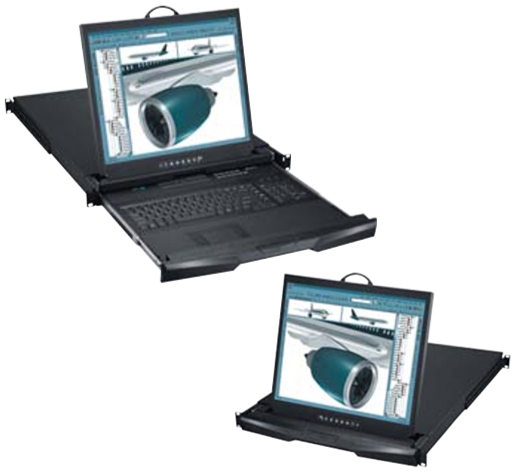 The product is 23.62" deep and has adjustable mounting brackets from 390mm to 845mm (15.3in to 33.2in). Unfortunately, we do not have a short depth LCD keyboard/monitor drawer that supports 1080p resolution at this time. I believe that they are in development, but we do not have any available. Answer: Thank you for your inquiry. For information regarding our international sales policy, please see: https://www.kvm-switches-online.com/info.html#International Orders. For a listing of our international partners, please visit: https://www.kvm-switches-online.com/international-partners.html. Question: Is the keyboard & track pad connected via USB? Answer: Thank you for your inquiry. This unit will use a proprietary Combo 4-1 Cable (CE-6 https://www.kvm-switches-online.com/ce-6.html), but will connect to the server (or KVM) via USB and VGA - or PS/2 and VGA. Answer: Thank you for your inquiry. We just heard back from the manufacturer who intimated there are a couple of styles of rails for the RKP117. Typically the unit should come with the appropriate slide rails for mounting in a four post rack. If you need replacement slide rails, however, the replacement part number will depend on the version of the RKP117 that you have. Please contact your KVM Switches Online representative at 1-877-586-6654 or via our online chat feature to discuss you project in greater detail so that we can get the right part for you. Question: RKP117 this product made in US or China? or Cyberview made from where? CyberView rack lcd consoles including the RKP117 are made in China and assembled in the United States. Question: I have been quoted P/N RKP-117-NE what does the NE indicate? 'Ne' or 'e' at the end of a CyberView product indicates 'Touchpad' option (the other option, 'Nb' or 'b' would indicate 'Trackball') as the mouse option for the unit. Note the drop-down options on top of this RKP117 product page - 'Touchpad' is the standard option if you order the P/N RKP117. Question: Could you please let us know which DB-15 USB KVM (cyber view) is compatible with the 17" LCD Console RKP117 model. We want to procure the above console and suitable KVM separately (without integration). Any CyberView DB-15 KVM switch or CyberView Cat6 KVM switch would be fully compatible with RKP117 (with standard VGA video input). If you have a deep enough rack you can also mount the KVM behind the RKP117 unit on the rear rails of your rack into 1 RMU. Let us know if you have any questions or there is anything else we can help you with!